On November 29, Johnson created a commission to investigate Kennedy's assassination chaired by Chief Justice Earl Warren. On May 22, in a speech at the University of Michigan, Johnson announced his intention to create a Great Society. 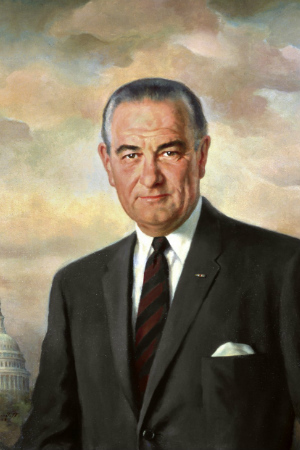 On July 2, Johnson signed the Civil Rights Act of 1964. 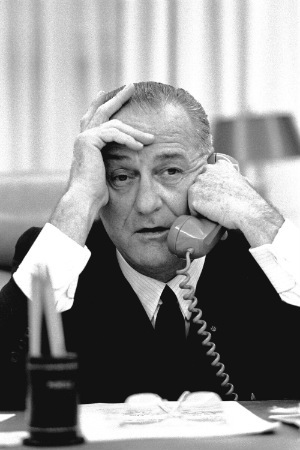 On August 7, in response to an incident with the North Vietnamese in the Gulf of Tonkin five days earlier, Congress passed the Gulf of Tonkin Resolution giving Johnson the power to pursue military action in Vietnam. On September 27, the Warren Commission released its report concluding that Lee Harvey Oswald acted alone. On February 9, bombing began in North Vietnam. On February 21, Malcolm X assassinated. 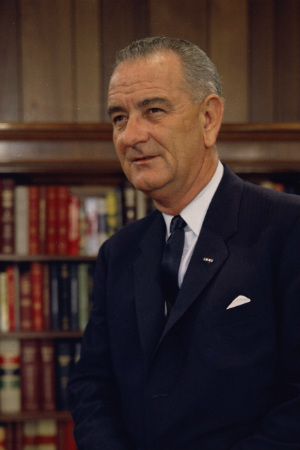 On July 30, Johnson signed the Social Security Amendments of 1965 creating Medicare and Medicaid. 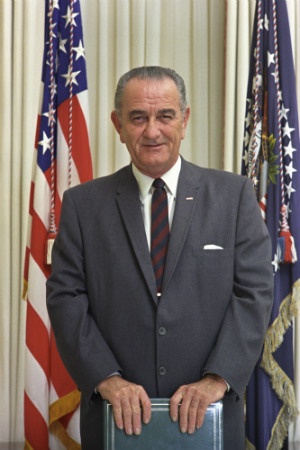 On August 5, Johnson signed the Voting Rights Act. On October 2, Thurgood Marshall became the first African American Supreme Court justice. On January 22, North Korean forces captured the U.S.S. Pueblo. On January 30, North Vietnam launched a major offensive during the Tet (Vietnamese New Year) holiday. On March 31, Johnson announced he would not seek reelection. On March 4, Martin Luther King, Jr. assassinated. On June 5, Democratic presidential candidate Robert F. Kennedy assassinated in California. Facts about Johnson and his presidency. 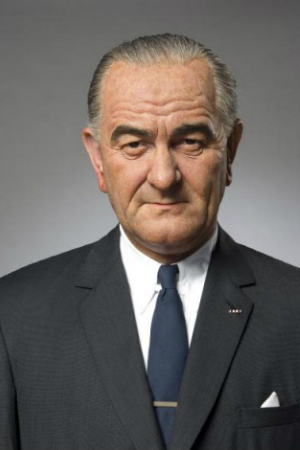 From a PBS broadcast of the same name, this essay excerpt by Robert Dallek discusses some of the issues and events that molded Johnson. This article by Karen Tumulty of the Washington Post evaluates the success of the Great Society 50 years later. The Austin, Texas site for the Johnson archives, museum exhibits, and events. Tour information also available. 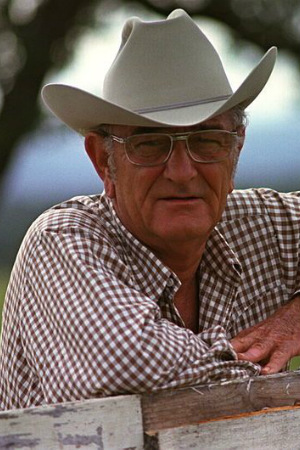 Located west of Johnson City, Texas, this park hosts the LBJ Ranch (also called the Texas White House), the Johnson Settlement and his boyhood home. Located in "the heart of Johnson country", this park provides camping, fishing, history and more. Visitor information and directions are available. 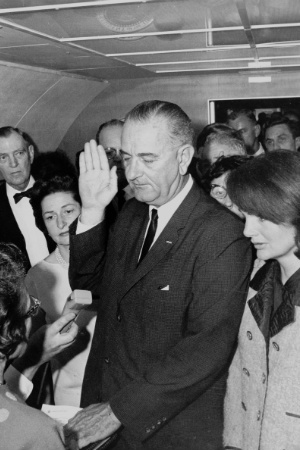 Johnson was the first president sworn in by a woman - Judge Sarah Hughes. Johnson was the first president to be awarded the Silver Star. Johnson was the first president to have been the Senate Majority Leader. Johnson voted against every civil right bill between 1937 and 1956. He strongly switched course in 1957 by pushing through the first civil right bill passed since 1875. Johnson was the first president to appoint an African American supreme court justice - Thurgood Marshall. Johnson was the first president to appoint an African American to his cabinet - Robert C. Weaver led the new Department of Housing and Urban Development.